In Gartner’s “Hype Cycle for IT Infrastructure and Outsourcing Services, 2013”,, Multi-sourcing Service Integration (MSI) or Service Integration and Management (SIAM) is described as sliding into the Trough of Disillusionment. By Gartner’s definitions, that means “because the technology does not live up to its overinflated expectations, it rapidly becomes unfashionable. Media interest wanes, except for a few cautionary tales.” This is often a characteristic of maturing capabilities with relatively low market penetration. To be clear, Gartner’s Hype Cycle curve describes an evolution of service adoption – from initial innovation, to expectations, through disillusionment to enlightenment and productivity. And in fact, they predict that MSI will have passed through this current phase and see mainstream adoption in only 2 to 5 years. So what is the story behind this so-called disillusionment? Much is being and has been written about MSI. In volume terms, most has been written by observers, commentators, analysts and advisors. Relatively less has been written by experienced practitioners, and simply because these are still early days. There are relatively few live instances out there. This series of articles is a practitioner’s perspective on some of the myths that are circulating, despite which a growing number of organisations are setting out on this journey and will reap the benefits of improved service, cost savings and ultimately increased revenues. Indeed many will find they finally benefit from IT as an enabler of innovation in their business. This is false. The Integrator should be self-funding and open up significant opportunities for savings among the other service providers in the Towers. In many ways, an Integrator is substituting for functions that already exist, so, approached carefully, this is a substitutional cost. 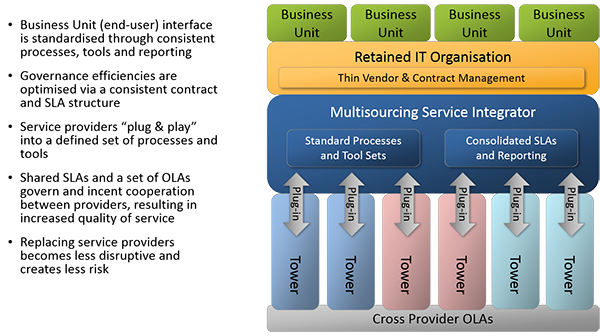 In non-MSI IT outsourcing contracts, there will be elements of cross-functional services – those areas where the supplier undertakes to make their service work effectively with those of other suppliers. It is these elements that tend to be the most poorly delivered, carry the most contingency cost or risk premium and, because they are an area of supplier insecurity, tend to stifle innovation. Typical cost ranges for cross-functional services are between 15% and 20%. At Integris Applied, it is our experience that it is reasonable to expect in every $100 of expense you can remove $20 to pay for substitution by an Integrator for $15 to $20 – a cost neutral outcome. Further, on a Tower by Tower basis, the greater visibility engineered by the introduction of an Integrator will allow you to remove another 5% to 10% in contingency cost or risk premium as each Tower is re-set and integrated, and as overlaps and duplications are identified and driven out. However, the real potential for efficiency gains lies in operations. The MSI model drives the parties to work and share together, through a combination of Operating Level Agreements, Shared Services Levels, and aligned incentives. The potential thus created is to see and innovate, to remove unnecessary processes, to be continuously lean. There can be another 15% efficiencies or more (dependent on the level of maturity of the operating environment). The State of Texas Department of Information Resources (DIR) offers the proof point for these assertions. In 2006, the State was experiencing significant challenges with its IT outsourcing model. After careful consideration and analysis, the State’s Department of Information Resources (DIR) determined that a different approach would be required to ensure the success of a stalled transformation project. In choosing to take the MSI route, the State was able to replace, repair and regain the original promise of transformation without paying $1 extra. the way we separated out the cross-functional responsibilities and created absolute visibility for all parties. Adoption of a Multisourcing Service Integration model not only should prove to be a cost-neutral exercise, it will drive service improvement, cost efficiencies (either returning savings to the business or allowing reinvestment) and ultimately improve business flexibility and innovation. Second myth – an Integrator is merely a substitute for governance. Many CEOs, CFOs and COOs continue to feel somewhat underwhelmed by the promise of IT outsourcing. 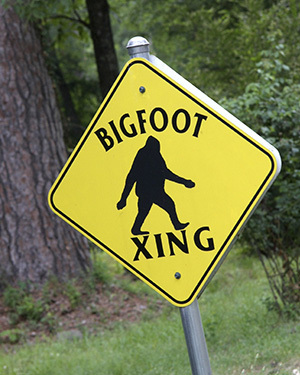 Cost efficiencies have often been elusive. The introduction of new IT systems has often been fraught. The pace of innovation and transformation has been slow. Some say that as much as 80% of IT outsourcing contracts have failed to deliver against plan. What is more, the retained IT organisation has become good at stepping in when things have been perceived as not going well. No matter what the degree of IT outsourcing that has occurred, it is the CIO that the organisation looks to when it comes to ensuring the delivery of effective IT services. S/he is the first person the Board turns to when something goes wrong. So the retained IT organisation rapidly evolves a habit of stepping in as and when problems arise. Instead of being the voice of the organisation, its business partner in the development of business services looking outward to the market, it increasingly develops a backward facing functionality that ends up duplicating some of what the supply chain is supposed to be delivering. As the organisation evolves from managing service silos to managing portfolios and beyond to service integration, there is a danger that the “policing” functionality of the retained organisation will just keep getting bigger in order to cope with the increasing demands of juggling the complexities of legacy and new systems. Indeed a recent survey by IT services company Calyx of some 200 CIOs and IT Directors suggests only a third see their main responsibility as driving strategic growth through technology and about a half spending most of their day fire-fighting. The system in these circumstances can become increasingly unwieldy, exaggerated by the difficulty of trying to manage suppliers in the delivery of cross-functional services, carefully built into their contracts, but rarely efficiently or effectively delivered – the real problem blocking the road of transformation, innovation and true ‘plug & play’ competition. To avoid this, the Service Integrator should be a separate function. The Service Integrator is the agent of Governance, enhancing and maturing its capabilities by performing specialised functions that will establish and balance the platform. It is a role that lives primarily in service delivery, performing coordination, validation and verification in support of the governance function. 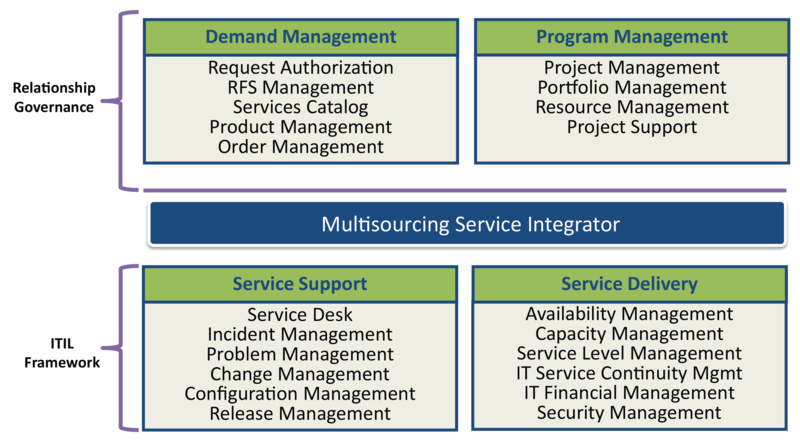 A Service Integrator’s role is to professionalise the cross-functional services, which formerly existed (or should have existed) within the scope of outsourced service delivery towers. This enables the governance function to focus on strategy and on the voice of the business – reinvigorating or even supercharging Governance. In our experience, this does not necessarily mean that the Integrator function needs to be provided by a third party – there is not a “one size fits all” solution. What makes for good governance at its heart is a clear separation of roles and responsibilities between client and supplier. It’s for good reason that most western democracies have clear separation of powers between executive, legislature and judiciary. The same can be said in IT sourcing. Many problems surface when the boundaries become blurred. When the client organisation steps in, questions of accountability become confused and the apportionment of responsibility becomes a battleground. Establishing or stabilising these critical functions through documentation of processes, role identification, and clarification of responsibilities is key to success, and we will shortly be publishing a detailed paper on factors to be considered in this regard when establishing a service integration function. This is particularly important when seeking to establish an in-house or hybrid service integration function. The pure-play approach of giving this function to an external party is the path preferred by many. It allows for the cleanest demarcation of responsibilities, and therefore each party – client, supplier and integrator – can most easily see and understand where responsibility lies and whom to hold to account. But the pure-play is not the only approach. At Integris Applied, we have seen models applied from the pure-play through various degrees of hybrid to full in-house. However, the overarching principle of the need for separation remains paramount, in our experience. The client governance team must retain overall policy direction, change approvals, and is ultimately accountable within the client to make sure that service providers are performing their contracted functions, as previously discussed. A maturing of cross-functional services will allow the governance team to better focus on their key role of interfacing with and serving their customers. The Services Integrator takes on the cross-functional services that are inherent in delivering any IT services; these cross-functional services are often based on a standard delivery framework such a ITIL or COBIT. These frameworks provide a solid base from which to allocate roles and responsibilities. Whatever the model adopted, always assuming that the vision and direction of travel are clear to all involved, a clearly understood allocation of roles and responsibilities should be arrived at and documented. 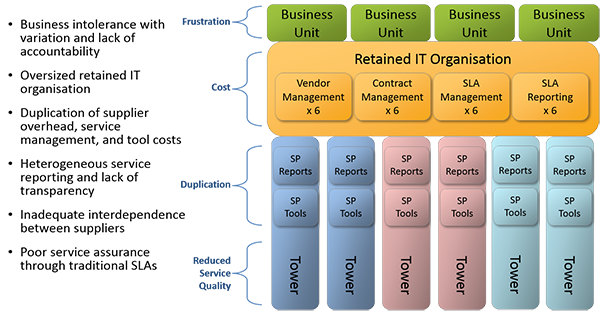 The figure above suggests one such allocation based on ITIL. Some of the functions that have traditionally been held by the client’s governance may fall to the Integrator in this process. 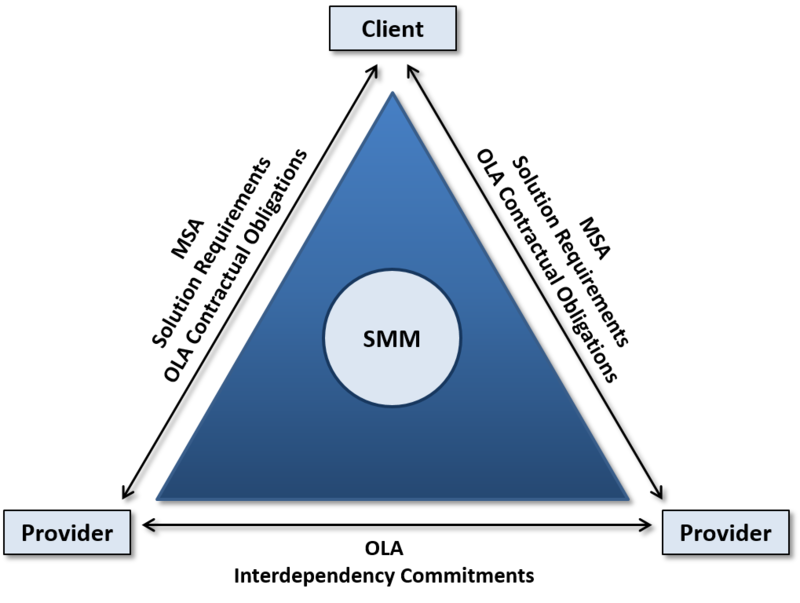 As illustrated by the figure below, policy will tend to be in the realm of the client and processes in that of the Integrator. I say “tend”, because this is a continuum. It might help to think of the point where the responsibilities of the two parties meet as the button on a slider control – it can be nearer one end or the other as required, and is not permanently fixed in any position over time. Talking to one organisation recently, who are moving towards a hybrid model, they could see how they might initially award more functions to an external organisation, but over time plan to bring more of those functions in-house as their implementation and skills base mature. The Service Integrator function is not a substitute for governance, but the agent of Governance, enhancing and maturing its capabilities by performing specialised functions. It is a role that lives primarily in service delivery, performing coordination, validation and verification in support of the governance function. A Service Integrator’s role is to professionalise cross-functional services, enabling the governance function to focus on strategy and on the voice of the business. It should be separate from both the supply chain and the client in order to give clear accountability, but provided this is clearly documented and understood, it does not necessarily have to be performed by a third party. Hybrid and in-house models can work effectively too. There is not a “one size fits all” solution here, and the model can and should evolve over time to meet changing needs and maturity of operations. In our next article, we will challenge the belief that Service Integration is just another name for Service Management. 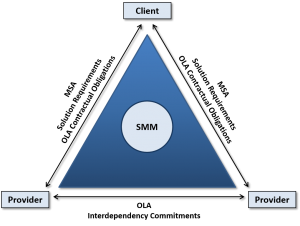 Third myth – Service Integration is just another name for Service Management. Key words here are “coordinate and integrate”. An orchestrated and fully integrated services platform will enable plug and play of multiple service providers across and within towers. In the UK, where the Government is driving for multiple, relatively lower value contracts of no more than 2 years duration, this is rapidly becoming the reality – constant churn. Such an environment drives the need for greater flexibility than is possible in a more traditional prime/sub environment. It needs to be much more than just good tools and good contracts. Good tools can bring efficient ticket handling and greater visibility. Good contracts will make contract management easier and can deliver a level of uniformity, but they’ll never be coterminous, and will invariably differ one from another in key areas. What good tools and good contracts cannot of themselves bring is the requisite level of stability and predictability to deal with changes in provider, technology and organisational demands while delivering consistently high levels of service to users. What it takes is an operational platform of practice built around shared tasks, shared accountabilities, and, with good tools in place, shared information. It’s about bringing all the service elements together (so it clearly goes beyond just providing a Service Desk, for instance). Which begs the question: can we more tightly define what an Integrator does? And the top level answer is Cross Functional + Co-ordination + Collaboration + Control. Cross-functional: as outlined in the first article in this series, the Integrator professionalises the cross-functional elements that go to make for the smooth delivery of cross-provider and cross-tower services. Co-ordination: ensuring that service elements from multiple sources, be they internal, unique, legacy, delivered by several similar providers or as a service from the Cloud, come together to provide an acceptable business service to users. Collaboration: creating a platform of practice underpinned by agreement between the parties to ensure they all work together for the common good, because they see their own advantage in so doing. Control: operating this platform on behalf of the client consistently and predictably. Once again, collaboration stands out as a key element in this way of working. How can such a platform be achieved and sustained given complexities of service sources and the need to be able to cope with change? There are at least two elements key to creating successful shared accountability: Operating Level Agreements and Shared Service Levels. Both are described in more detail in another of our papers, but here are the points relevant to the present argument. OLAs create a bond between service providers that is enforced by the contracts between each service provider and the client. The OLAs are a component of the services each service provider must deliver to the client and are intended to clarify the roles and responsibilities of those providers. There are three parts to the OLA structure, and the Integrator drives this process development, including development of and changes to the OLA elements. The first consists of the obligations between service providers and client. The other two provide the detail of the OLAs between the service providers. In an environment where successful delivery of service to the end user relies on elements from multiple providers, the service level methodology must recognise that success is a joint responsibility. It is important to note that not all service levels in this approach are shared among service providers. There are three categories of service levels, and only the fully shared category includes a single measurement that affects two or more providers. A Service Integrator ensures the delivery of consistent and predictable service through developing and sustaining with the service providers an operational platform of practice built around shared tasks, shared accountability, and shared information. With the right contracting platform and relationships in place, the Integrator can greatly improve overall success in meeting the standardisation needs of the enterprise while addressing the bespoke requirements of the individual end customers. This is much more than simply service management. We’re ready to embark on this journey with you. Contact us for more information about Integris Applied or to schedule a consultation.